It’s been such an exciting week here at BT—we’ve introduced our Fall ’15 collection as well as the newest member of our American-sourced and spun yarn family: Quarry. This yarn has been in the works for quite some time; yesterday I checked back over my notes to see just how long we’ve been kicking the idea around behind the scenes: my first discussions with the mill in Harrisville about developing a chunky weight date all the way back to late 2013! I’ve always loved working with “unspun” yarns(the most well-known unspun yarn in the industry is probably Plötulopi in Iceland) for their unique lightness and spongy hand. When I first started working with the Wyoming-grown Targhee-Columbia wool that we use in our Shelter and Loft lines, I loved the character of the fleece and thought that it would be fun experimenting with an unspun version that would allow the intrinsic qualities of the wool to shine. Since the staple length of Targhee is on the shorter side (especially when compared with longer, coarser wools that are traditionally used for unspun yarn construction), I knew we’d probably need to come up with something more creative to give the look and feel of a roving yarn without sacrificing structural integrity. In the end, we landed on what’s called a “mock twist” in the spinning industry—a type of yarn construction that creates a faux single-ply look by way of combining separate plies of sliver (a single ply of unspun wool fiber with no twist whatsoever) together with a gentle ply twist. 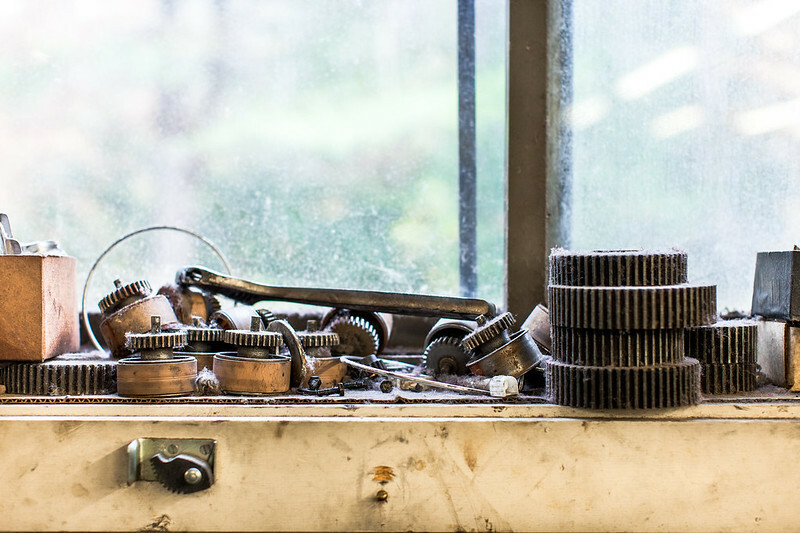 When I learned about this type of spinning, it really got my gears turning (no pun intended). After some trial and error with ply count, twist strength, and so on, we ended up putting together a chunky mock-twist yarn composed of three individual (unspun) plies. The result is a yarn that looks like a roving-style “singles” but maintains some desirable qualities from a 3-ply yarn construction: a round structure (great for stitch definition—Quarry really loves cables and brioche) as well as more tensile strength than a single-ply roving yarn. It’s still quite softly spun of course, but has a built-in structure that makes it behave more interestingly on the needles than other non-plied prototypes we tested. And what about the name? Quarry? When the first tests of the final prototype were happening at the mill last summer, I happened to be on a trip to Arizona visiting the Grand Canyon (oh the beauty of that place!—that’s a subject for another post entirely) and was experiencing color inspiration overload (I’ve included a few of my photos from that trip here). One of the unexpected surprises in developing Quarry was the way that the the mock-twist construction affected the appearance of the blended colors. 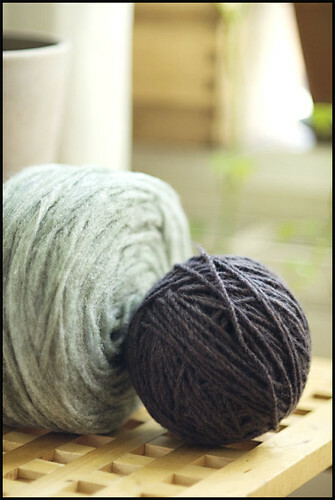 The heathering that comes from mixing pre-dyed wool before spinning appears differently in Quarry than it does in Shelter and Loft. 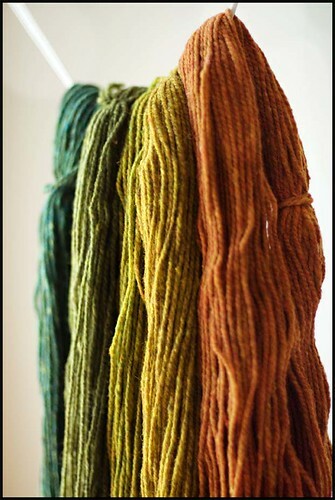 Rather than creating traditional tweedy flecks, the colors mix in a more painterly, striated fashion (see the first photo in this post for a good example). This beautiful texture really reminded me of the tonal colors and layered patterns that abound in the canyon—and the concept for a palette inspired by geology was born. I’m excited to finally be able to share this new yarn with you, and introduce it to you with some of my current knitting projects. This week I’m starting in on a Cowichan-inspired colorwork “camping vest” for my first rainy season back here in the PNW using three colors of Quarry. If you’re curious to see how the yarn knits up, I’ll be sharing my progress here on the blog and on my shiny new Instagram feed (@jared_flood) as well. 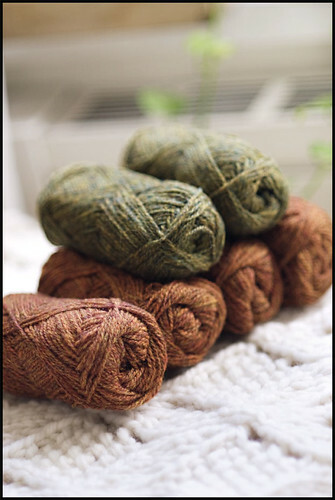 I hope you enjoy this new yarn we’ve created—I look forward to seeing what you’re knitting with Quarry, too! 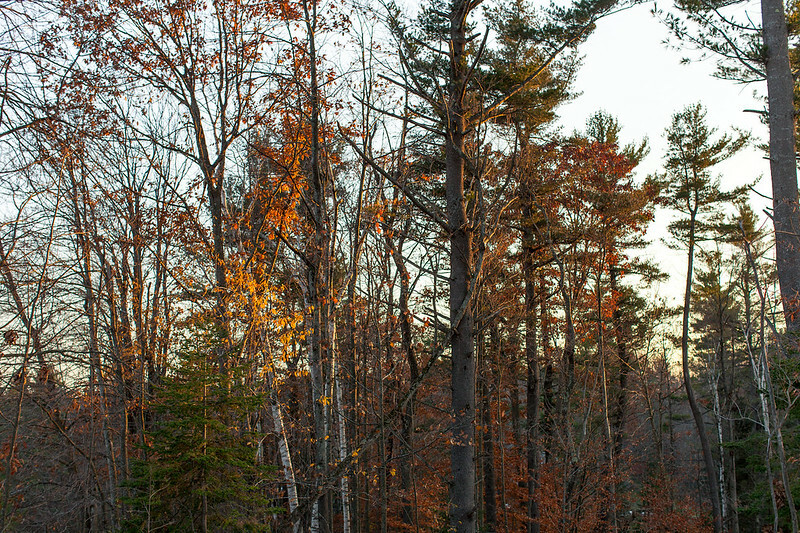 Resuming this morning with more imagery from October in Harrsiville and the surrounding landscape. 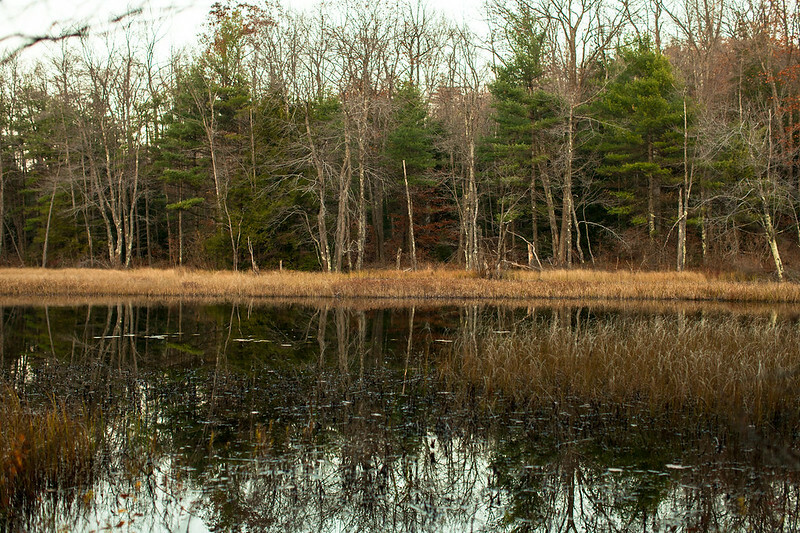 You’ll notice a reflection theme running through these images. 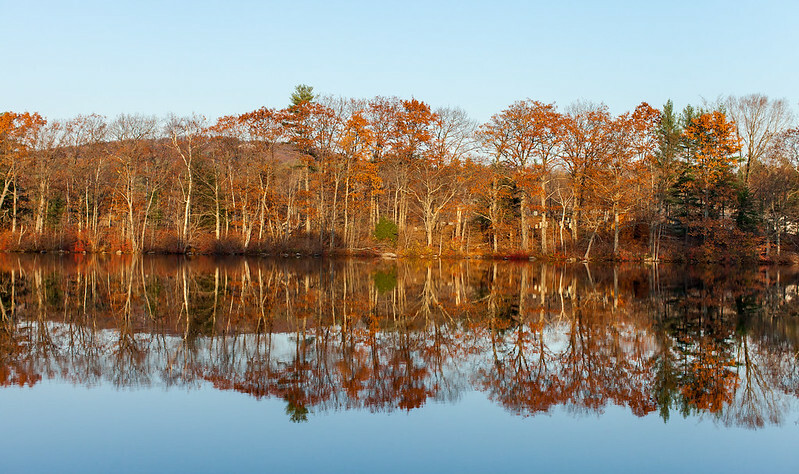 The nearby lakes and ponds were all so glassy and still – they look like mirrors in the early morning light. Beautiful. 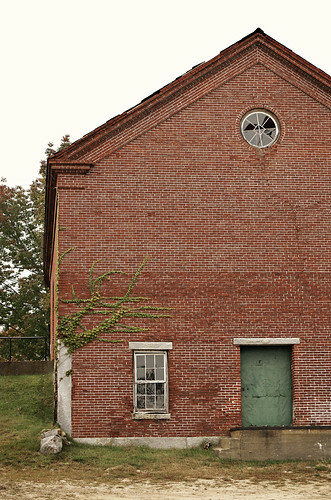 Just before the big crazy storm weather started, I spent the week in Harrisville at the spinning mill. 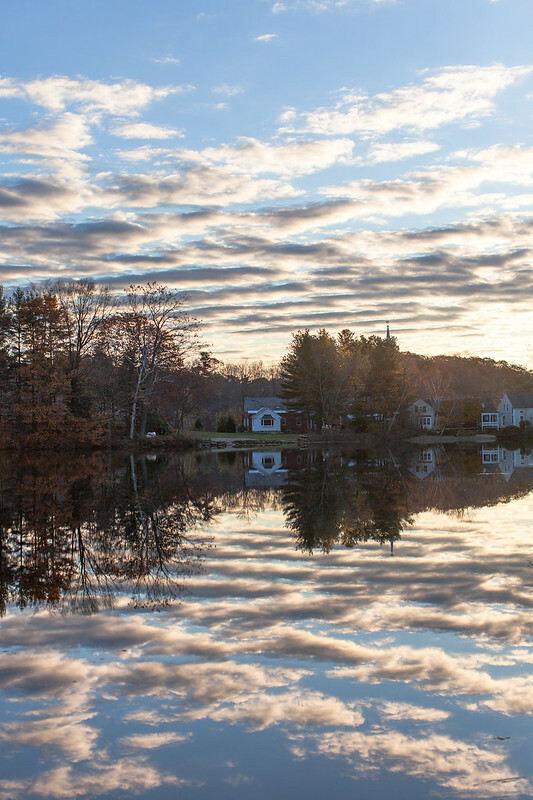 The village is stunningly beautiful in all seasons, but nestling into the heart of New England in late October is particularly special. 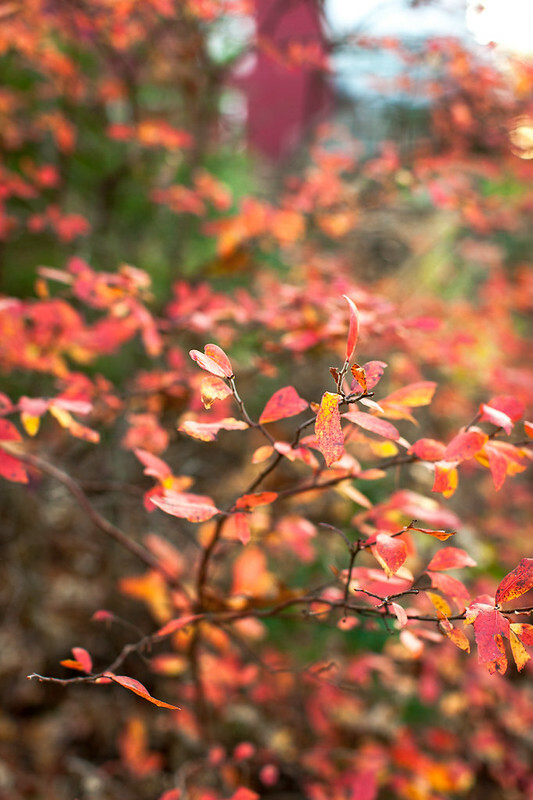 When in need of color inspiration, there aren’t too many things that can beat the myriad shades of fiery foliage that abound in this part of the country. 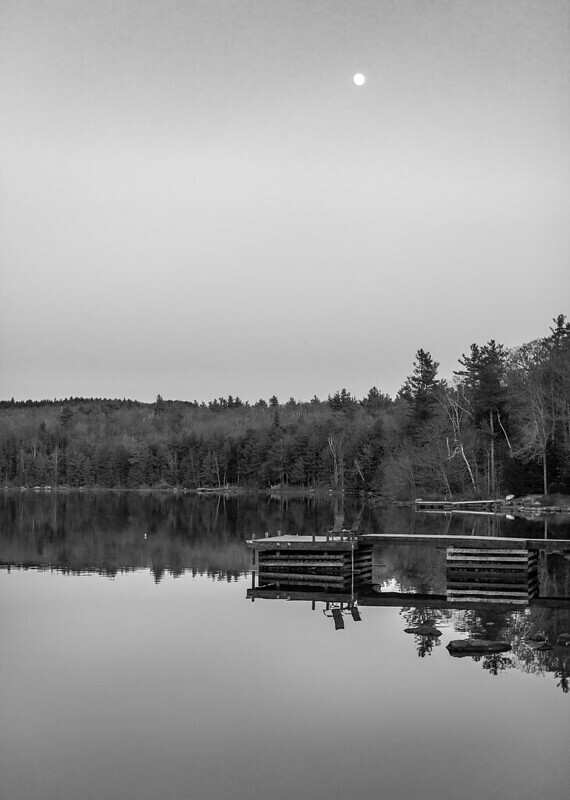 When in Harrisville, my shutter finger really starts twitching – so I thought I’d share some photographs from my trip with you this morning. From the very beginning I was firmly committed to Shelter being a true woolen-spun 2-ply yarn. I’ve always been a sucker for Woolen-Spun — I find them classic, comfortable, and beautiful. The texture, which to some degree always stays true to the look and feel of the animal’s natural appearance, gets me every time. Before Shelter could be a reality (or even a possibility), I knew that finding the right mill was absolutely crucial. 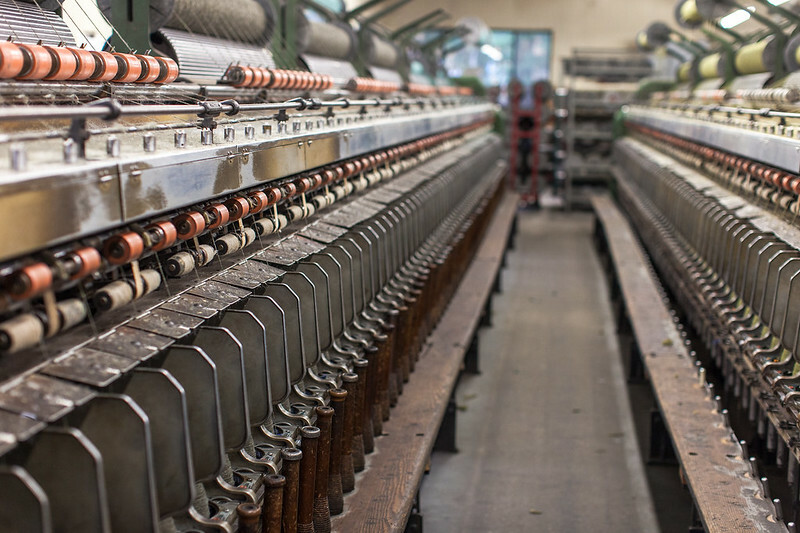 The first unfortunate obstacle in the process made itself blatantly apparent right away: the number of remaining US mills equipped to spin Woolen are severely limited today — few exist as the last bastions of a bygone era in US textile production. An aside: you’ll hear me throwing the term Woolen around a lot as I talk about Shelter. This term isn’t meant to signify “something made of wool”, but rather refer to the process by which a yarn is prepared and spun. 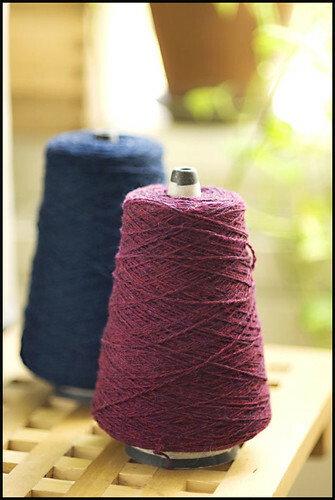 Yarns (generally) fall into two categories – Worsted Spun (a term which, confusingly, has nothing to do with a yarn’s weight) or Woolen Spun. The equipment needed for creating both of these types of yarn is quite different, and Worsted Spun processes tend to be more widely used for commercial yarns in both the handknitting and machine knitting/fashion industries. Us sheep-lovers though, we have a very special place in our hearts for The Woolen. 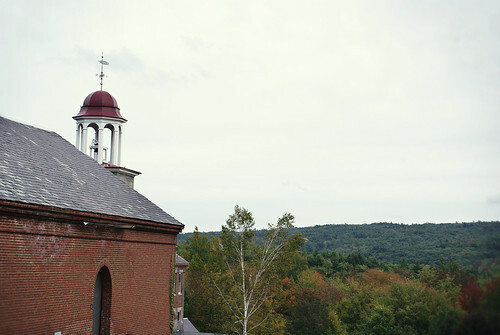 Harrisville is an historic mill town located in the Monadnock Highlands of New Hampshire. 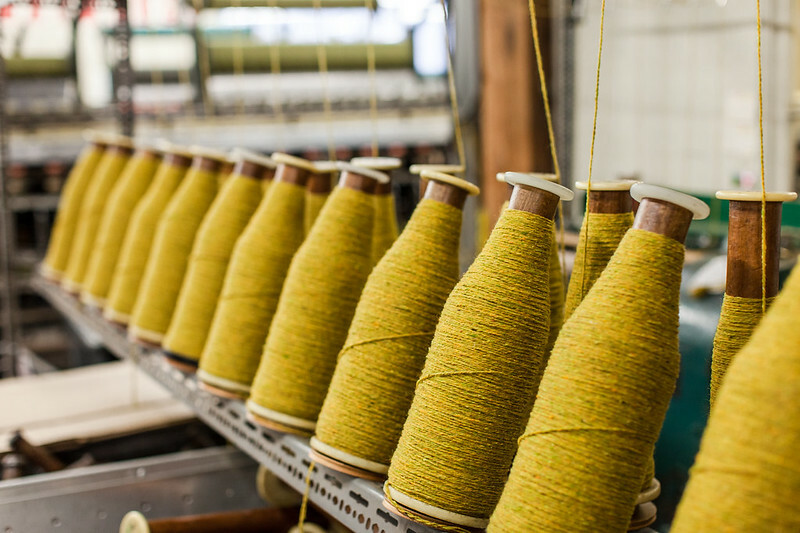 Woolen yarns have been produced here since 1794 – a fact alone that is simply powerful! 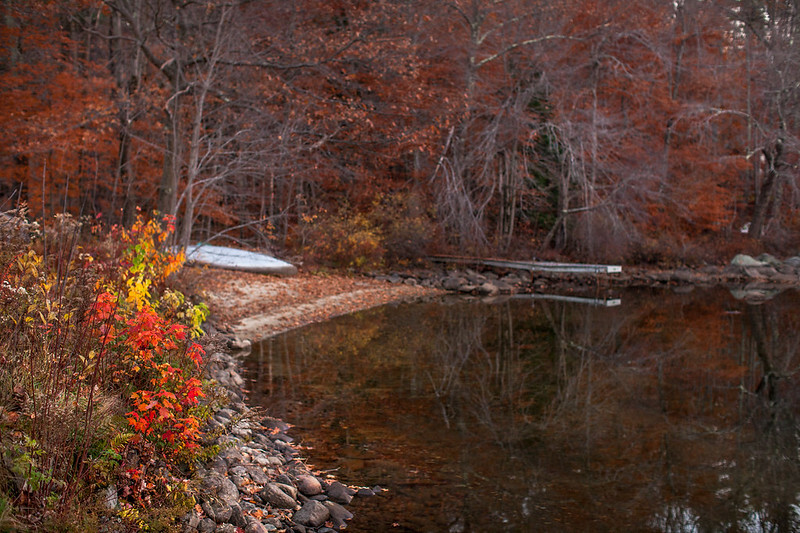 When I made my first visit in early Fall of 2009, I remember driving through the woods to the village and being astounded by the beautiful jewel that I encountered. 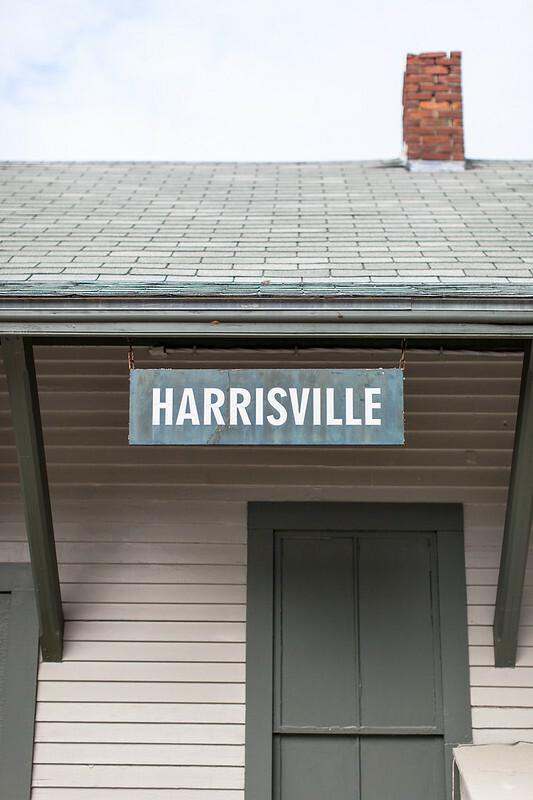 Harrisville is an historic preservation site and the only early-19th-Century industrial community that still survives in its original form in the US. That means gorgeous brick buildings, a quaint and friendly General Store, a placid stream running through town, and a beautiful mill at the heart of it all. Many of you I’m sure are already familiar, as I was, with Harrisville Designs’ own line of high quality knitting and weaving yarns. Before I even got out of my car on the day of our first meeting, I was crossing my fingers that they would be open to the idea of custom spinning yarn for a complete stranger. 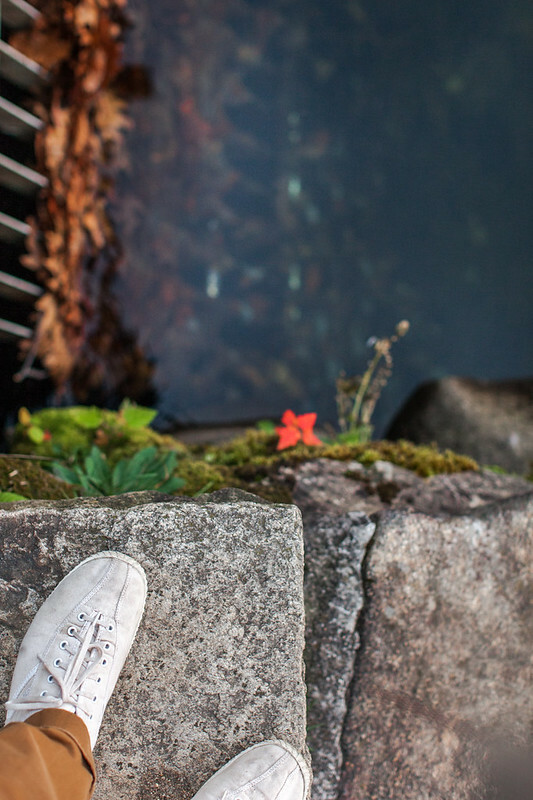 The setting and the energy of the place felt so right from the very first moment. A few hours later, that feeling was confirmed as I concluded the first of many meetings soon to come with the hard working and passionate folks at the mill. They were up for the challenge and from that moment forward Shelter became a collaboration in the truest sense. Not only have I learned so much from working with them this year, but have also been helped and guided at many points along the way when I needed advice from experienced yarn makers. 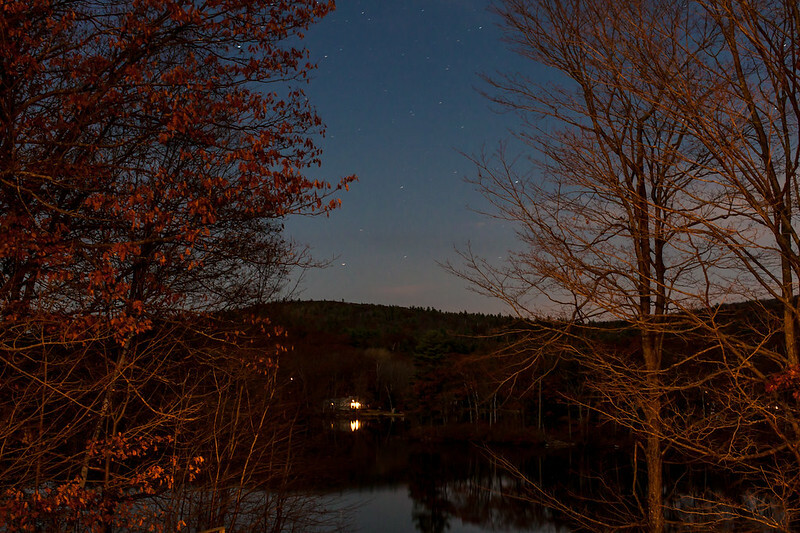 Harrisville is and has always been known for quality. I am so proud that they have been such an integral part in this process and that we, as knitters, have yet another way of supporting their efforts in producing woolen products that we can continue to enjoy. 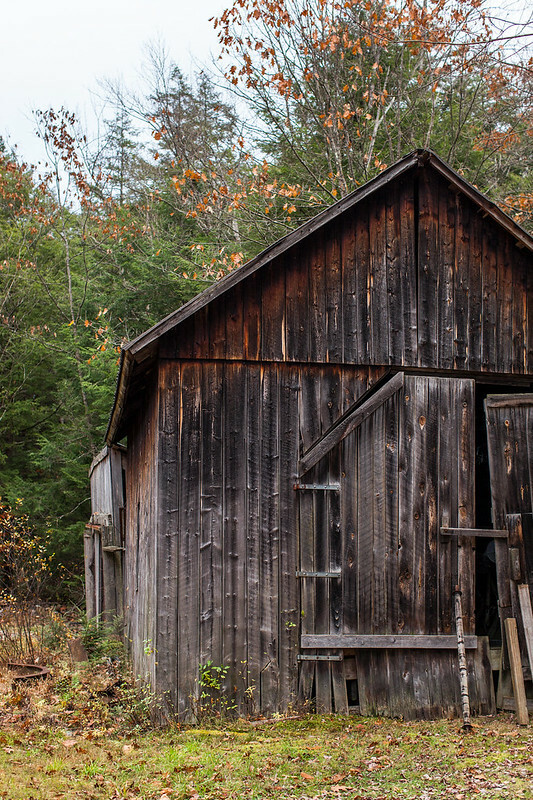 *Some photos in this post were provided courtesy of my friend Carrie Hoge, who accompanied me on one of my first trips to the mill. It’s the first day of my favorite month of the year. A day I’ve been thinking about for a long time — not just because October signals the true onset of Fall, but because on this day, this year, I get to share with you a very special labor of love that I’ve been nursing behind the scenes since last October. A little over a year ago, I decided to take a risk. To give myself a challenge and a goal and pursue something that I had been thinking and dreaming of for a very long time. It’s no surprise to anyone that I’m a Wool Lover through-and-through, and today I get to introduce to you a very special new wool — one that has been meticulously and lovingly developed behind the scenes here just for Knitters. 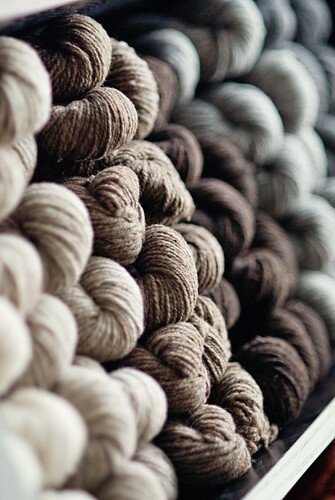 I would like you to meet SHELTER — a new line of artisanal American wool yarn for handknitting. As the summer ended last year, I began researching answers to very specific questions I had been asking myself for some time: With such a rich textile history and an abundance of wool and other resources, why does it sometimes seem so difficult to obtain American yarns in our booming US knitting community? Would it be possible to develop a 100% American sourced, spun, and designed yarn that could be presented in a compelling way to knitters? What would a yarn look like that was developed from Stage One by a single person with no one to answer to but his own personal wool obsession? The desire to answer these questions sparked the beginning of a year-long journey – one that begins a new chapter today, as SHELTER takes its first steps into the real world. 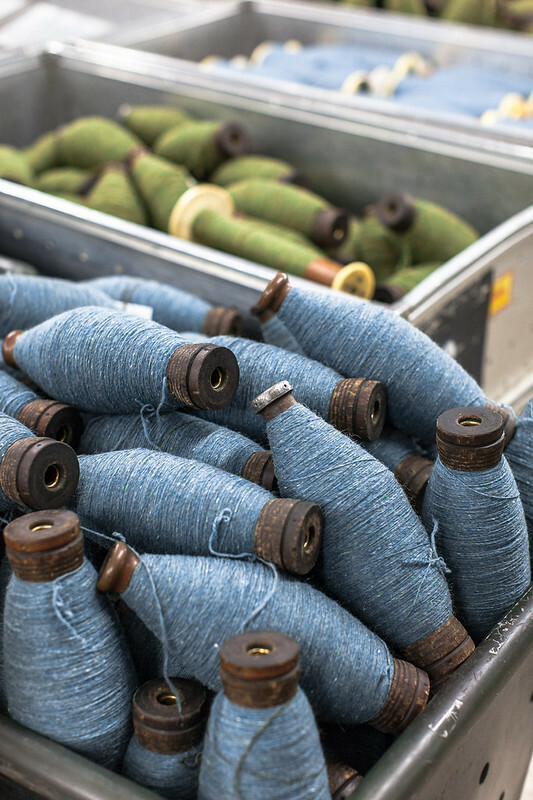 Over the next few days I’ll be blogging about what has been a gloriously rewarding experience for me designing this special yarn: sourcing American-grown wools, supporting an historic US mill, developing a palette of rich heathered tweeds, and designing a collection with a yarn that I absolutely love knitting with. I hope you’ll stick around for the story — but in the meantime, I’ll let you in on the highlights below. SHELTER is a woolen-spun 2-ply yarn made from American Targhee-Columbia fleece, grown in Wyoming. 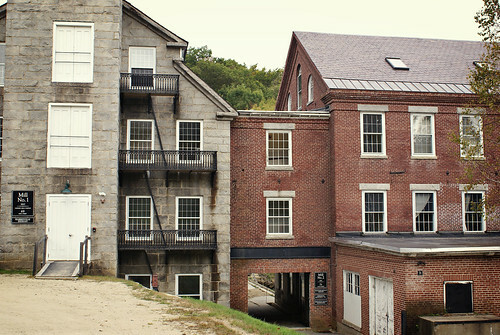 The yarn is spun in historic Harrisville, New Hampshire in the heart of New England, in a mill town that has been producing woolen yarns and fabrics since 1794. I have developed a palette of 17 shades including both rich, autumnal colors as well as natural sheep-colors (you didn’t think I’d forget the greys, did you?) The yarn is a very lightly-spun lofty material that, as a result of it’s woolen-spun process, knits at a variety of gauges comfortably without losing fabric integrity. 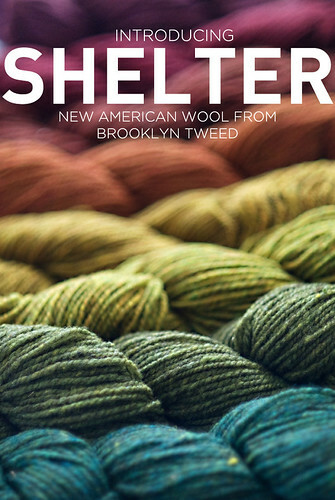 Starting today, SHELTER is available for purchase online through (the new and improved) Brooklyn Tweed, as well as in 9 very special Flagship Locations around the country. These exclusive stores carry all 17 colors of SHELTER as well as pattern support from the new Fall collection. They are shops whose efforts I’ve admired for a long time as having vision for the possibilities of knitting’s exciting future. I am honored to have SHELTER on their shelves! Globally speaking, I think that knitters should be able to procure wools of high-quality that support designers, farmers and mills in our own back yard. 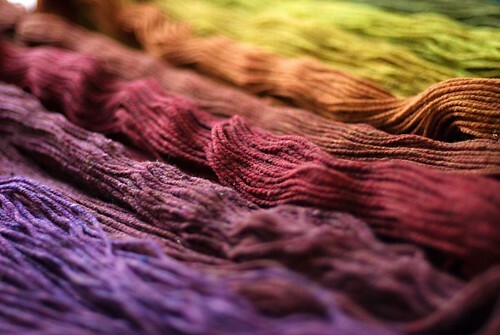 I think there is now becoming an opportunity for yarns to tell us a story, and offer us a connection to something deeper than just the experience we’re having on our needles. Consider this my contribution to that cause. I very much hope that you enjoy it. 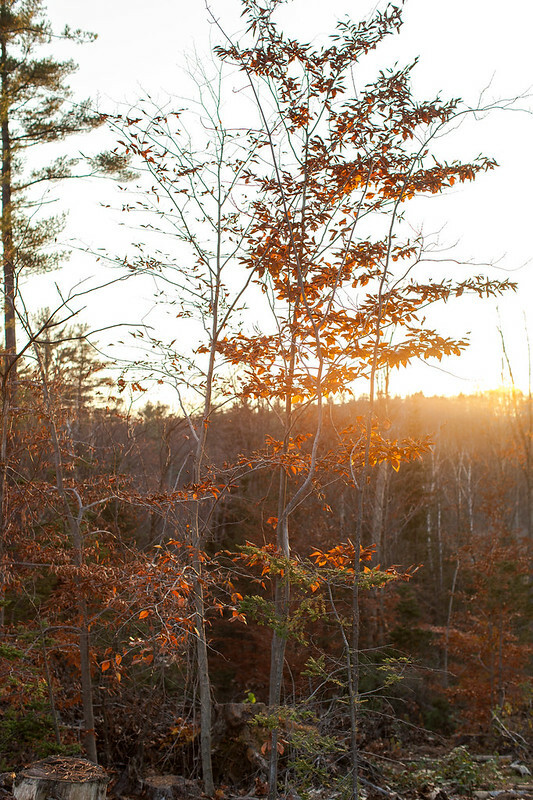 Fall Loves You, Wool. And So Do I. Well. It’s been a wild month of travel for me — from Oklahoma City, to Philadelphia, to Texas, to New England and many a space in between. I’ve had the wonderful fortune of knitting with folks from all over the country and it has been an absolute pleasure. When I returned to Brooklyn on Monday for a two week break from airplanes, I sat down at my knitting window and realized that transition-time was over and Fall has, in my absence, made itself quite at home here in the city. 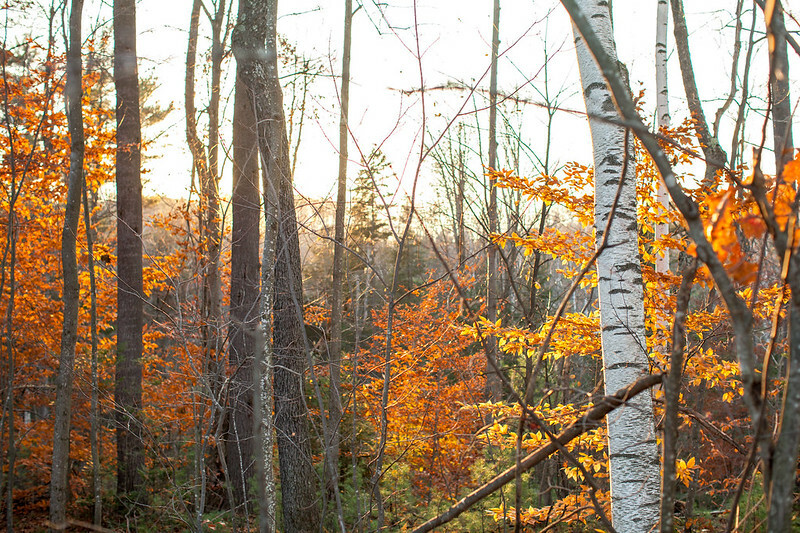 The click of the seasons is something that gives me pleasure beyond words, and Summer to Fall, not surprisingly, has got to be the most special time of year for us knitters. 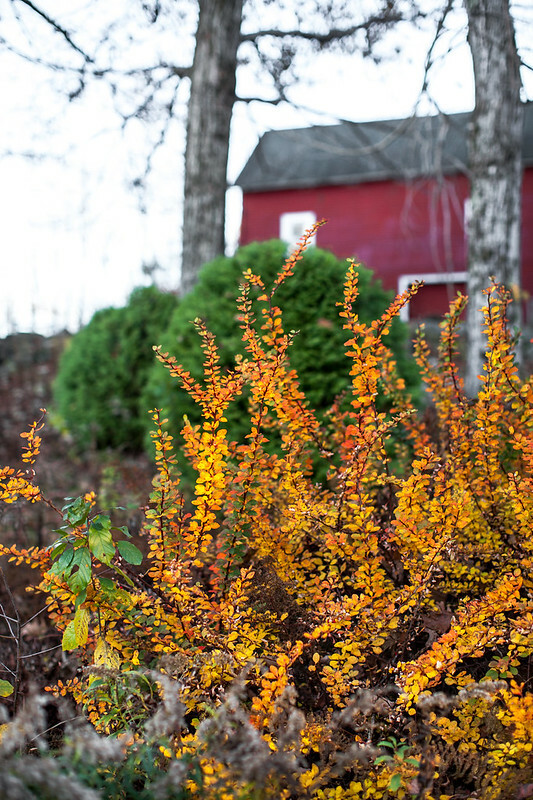 It’s usually about the second week of October when my fingers start to twitch even more than usual for soft, wool sweaters on my needles and my eyes desire a bath of materials in rich, autumn heathers. What else does October mean? It’s the one time of year that I knowingly cast my self-control to the wind and embrace even my most irrational wool cravings, which means I generally acquire more during this period than any other. So, in the spirit of full disclosure, I might as well share with you some recent acquisitions from my travels and yarns that are frankly keeping me up at night with giddy anticipation. 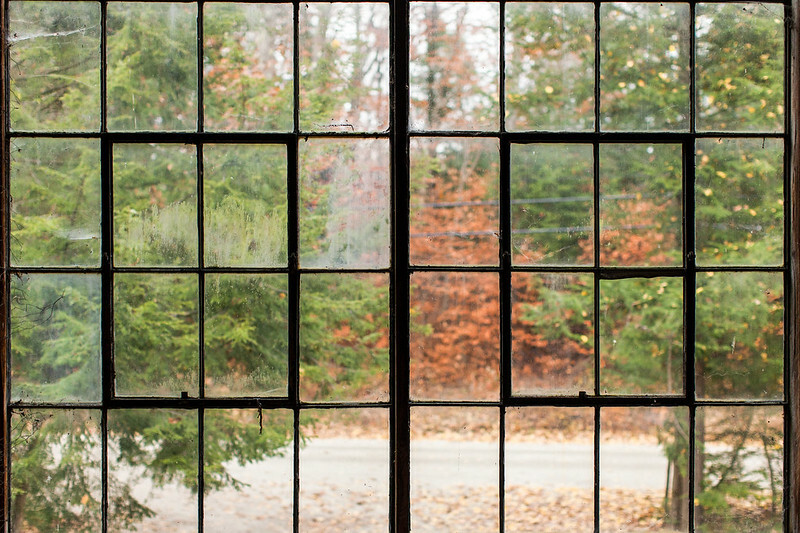 A few weeks ago I had the pleasure of visiting Historic Harrisville in New Hampshire — home of some of my very favorite American-milled yarns and a historic treasure for our national textile tradition. I’ve been on a major lace knitting stint lately (before the sweater monster came to bite) and these are both slated for woollie shawls. 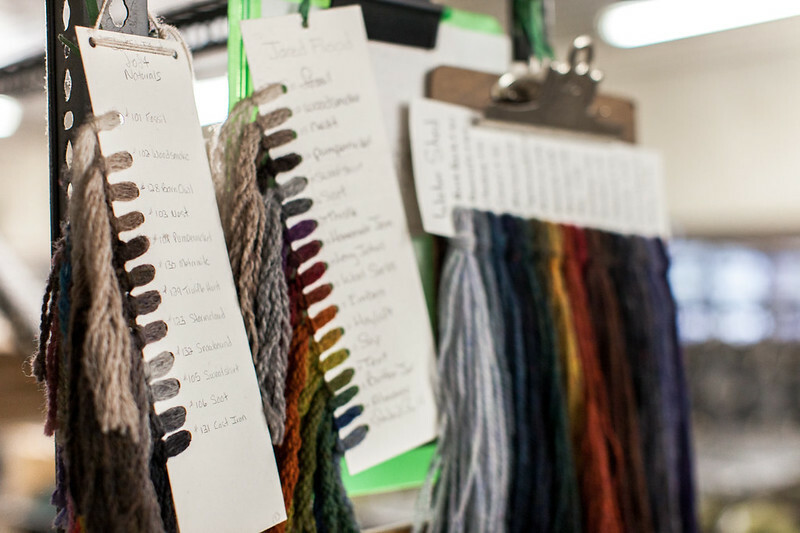 Harrisville Designs is like a wool-lovers paradise: walls of colorful, sturdy wools housed in a 2-century-old brick building nestled directly over a stream (if you peak through a knot-hole in the floor boards you’ll see the flowing waters of the stream below). 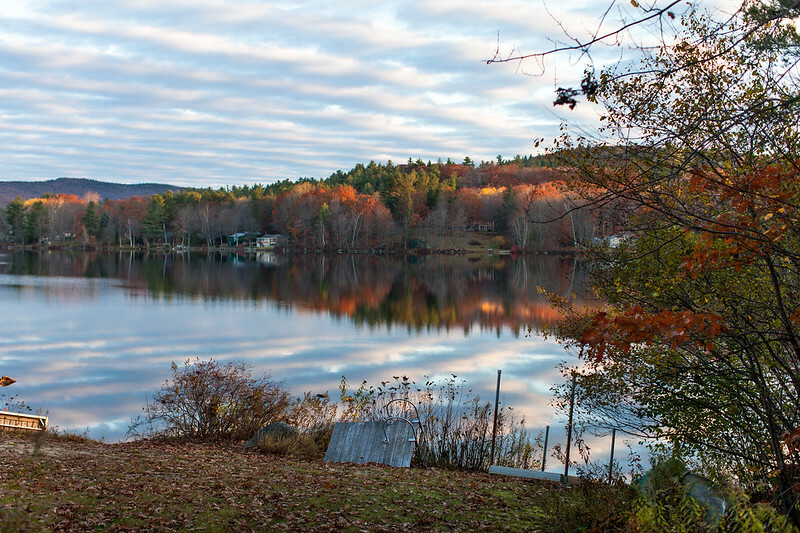 A destination for any knitter’s New England itinerary… and a destination I hope to return to in the future. Another wool that has recently sent me headlong into infatuation comes from the opposite coast and my home region of the Pacific Northwest. 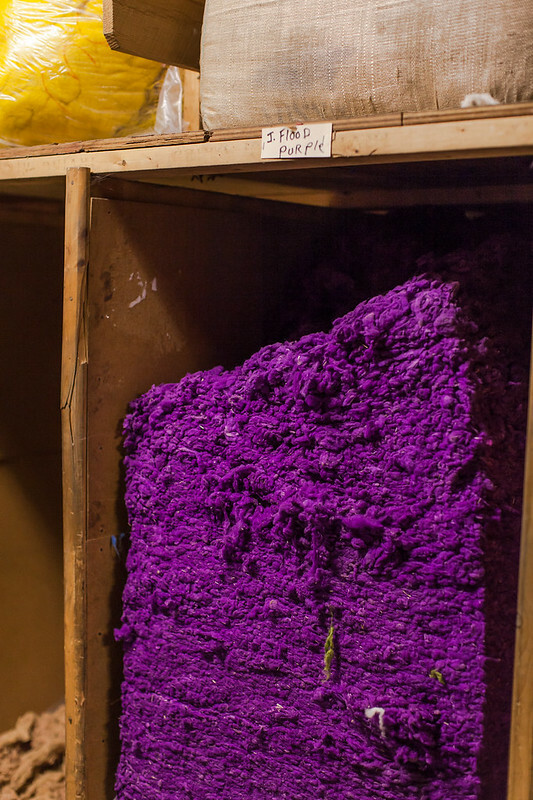 Imperial Stock Ranch makes beautiful, Oregon-grown yarns from their 125+ year old flock of Columbia Sheep (the farm, which is a National Historic District, has been responsible in part for developing this wonderful breed). The yarns are minimally processed using antique spinning techniques (a la many other favorite yarns you’ve heard me wax poetic about in the past — Beaverslide Dry Goods in MT and Marr Havenin MI, most notably) and come in both two-ply woolen spun yarns (yum!) 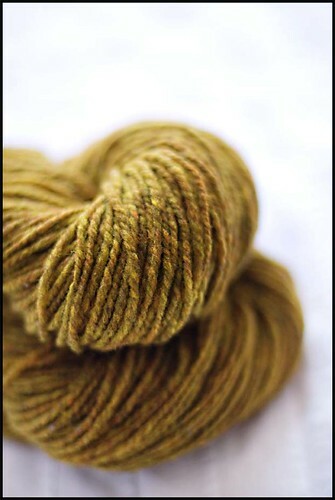 and a wonderful unspun bulky “puck”, similar to Unspun Icelandic Wool. While the company has been in business for decades, their recent push into the world of hand knitting is one that I think is a very welcome addition to the industry. And no Fall knitting would be complete without a healthy dose of Shetland Jumper-Weight wools straight from the island. You may be sick of me talking about my wool-standby, but I do start to get nervous if I’m away from this stuff for too long. To me, Shetland yarns are truly fine wines in our world of materials. With these? More lace. Always more lace. I must sound like a glutton at this point, pulling in all this wool for Fall (there’s more too…but we won’t go there today) but if you can’t be a wool glutton in the Fall, when can you be? And there’s no better way to spend the afternoon than quietly working stitches in a good, solid wool as you watch the fading golden light play across the increasingly bare branches. Despite the natural world telling us that Fall symbolizes the end of something, to me it represents a new beginning and a new inspiration. 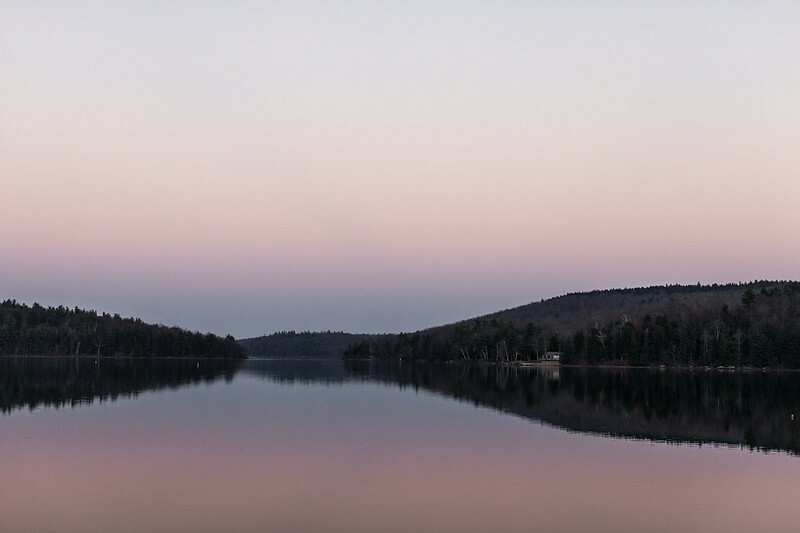 I hope you are feeling inspired by the wools under your roof and the cooler breezes that are causing us to grab our woolens on the way out the door. Lets enjoy it while it’s here!